Some days I am in no mood to cook for lunch, neither eat a heavy one. Especially when the children are in school and the dear hubby at work and I am racing to get as much done as possible without any distraction present:-). Does that happen to any of you? These are the days when I fix myself this protein filled colorful salad and a glass of smoothie. And it it healthy too. I love roasted tomatoes. I love it just like that and I love it on anything. Nice and refreshing with no after taste of the regular spicy Indian food. I also use this salad for picnics. The kids love picking through the beans and the nuts. Sometimes I serve it at the parties as a quick snack, along with Mint Chutney and Yogurt on the side for anyone who wants to top it with something. I am sending this to Divya’s Diet Food Event. Roughly chop the Tomatoes and drizzle olive oil on them. Either grill them lightly or Oven Roast them till the skins turn slightly brown. Rub the Cumin seeds in the palm of your hands to release the flavor. Combine all the chickpeas, hot pepper, tomatoes, onion, salt, cumin seeds, chopped cilantro, and the toasted almonds and toss. 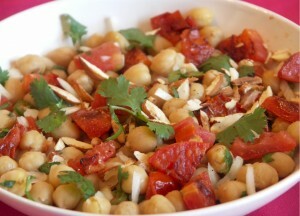 Whisk together Black pepper, Olive oil and Lemon Juice and add it to the chickpeas and toss again. Note: Small Fresh Cherry Tomatoes can be roasted too. Personally I love the little roasted cherry tomatoes on my salad. I did not have them at home, so I used whatever I had. looks healthy ! would love to substitute this as any one of lunch menus. Now Ramadan going on…Looking for some quick recipe for Iftar..This one is the perfect one…I did not have the almond so used peanuts…Turned out really good…Also added chopped cucumber…. It was a warm day and I wanted something refreshing for lunch. I had this with bread and it tasted great. Thanks Soma for coming up with simple, easy, refreshing and nutritious recipes like this. I love your blog. Looks like a healthy n quick salad to whip up..Thanks for the wonderful entry Soma.. Thanks for that. My son has a terrible aversion to eating fruit , so I make the fruit into smoothies for him and then he can’t get enough of it! I also found some great smoothie recipes here and thought I’d share – lots of other great ideas there.